Leading Exporter of concrete hollow brick making machine, fully automatic hollow block machine, high density hollow block making machine, high technology hollow block making machine, fully automatic hollow block making machine and hollow block making machine from Coimbatore. Electrical system consists of Delta PLC control system and Delta Touch Screen, with data input and output; control system has safety logic control and trouble-shooting functions. Hydraulic System: uses double high-dynamic proportional valves, which automatically adjust the oil flow and pressure, to guarantee the precise movement between the tamper head and mould. Heavy duty machine structure, which is made of high density cast steel, is vibration proof.Four rods guiding system and long guide bushing assure the precise movement between the tamper head and the mould. Highly productive moulding device, which consists 360 rotating and compulsory feeding of raw materials, platform vibrating and compression shaping, greatly improves the cycle time. The finished blocks are of good shape and high quality. Our machines, with harmonic cooperation between mechanical, electrical and hydraulic machines functions, guarantees a reliable and high production output of concrete products. The moulds are changeable, and it is able to produce various kind of blocks,bricks,interlocks, pavers and kerbstones in different types, sizes, shapes, and colour layers. With face mix device, its able to produce pavers with colour layer. 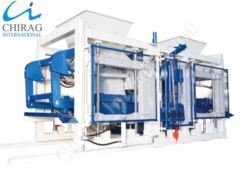 We are engaged in offering a wide range of Fully Automatic Hollow Block Machine( This machine is Multifunctional, Could make all kinds of Blocks,Bricks and Pavers while change the moulds.) Simple structure; small occupying area; stable and reliable function and convenient maintaining; Simple manual operation enables the workers to learn fast; This machine combines many functions into one with low consumption. It is adopting with multi-valves in series, electricity discharging unit and compressing and vibrating organic combing unit to materialize the highest molding and density of the finished products.Auto pallets conveying, pallets feeding and compulsive materials arranging have highly raised up the production efficiency and reduced the working intensity, while simple pallet conveying and feeding units can be installed for production. Electrical system consists of Delta PLC control system and Delta Touch Screen, with data input and output; control system has safety logic control and trouble-shooting functions. Hydraulic System: uses double high-dynamic proportional valves, which automatically adjust the oil flow and pressure, to guarantee the precise movement between the tamper head and mould. 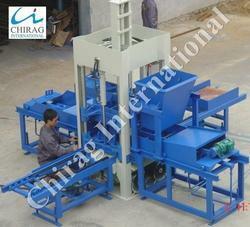 Heavy duty machine structure, which is made of high density cast steel, is vibration proof. Four rods guiding system and long guide bushing assure the precise movement between the tamper head and the mould. Highly productive moulding device, which consists 360 rotating and compulsory feeding of raw materials, platform vibrating and compression shaping, greatly improves the cycle time. The finished blocks are of good shape and high quality. Our machines, with harmonic cooperation between mechanical, electrical and hydraulic machines functions, guarantees a reliable and high production output of concrete products. The moulds are changeable, and it is able to produce various kind of blocks,bricks,interlocks, pavers and kerbstones in different types, sizes, shapes, and colour layers.With face mix device, its able to produce pavers with colour layer. 1. Larger productivity than the other small block machines. This kind of brick machine is manufactured on the base of technical modifications to the original block shaping machines, that is changing the former one-time-vibration into twice vibrations of moulding core. So the block density becomes higher, shaping speed quicker and block strength more even. 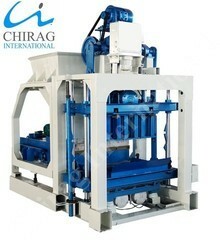 This model of machine can be suitable to the customers who have any kinds of existing cement working sites2. Advanced techniques made the host machine designed reasonably, and achieved box vibration, hydraulic stripping, omnidirectional automatically movement. 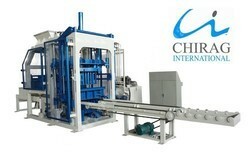 Machine works faster because of automatically feeding system. High quality of steel and precision welding made the machine a longer service life and hydraulic system made less fault during work.3.Several function features, such as low price, reliable performance, easy operated, stable, lower power consumption(just one sixth power consumption of the machine which has the same output).Mass raw material can be used during production, for concrete, cement, small stone, powder, sand, coal gangue, slag, construction waste and so on. 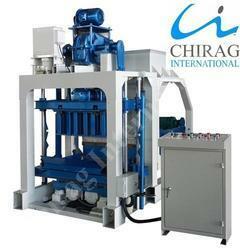 Looking for “Hollow Block Machine”?